I received a call from a guy named Andy. 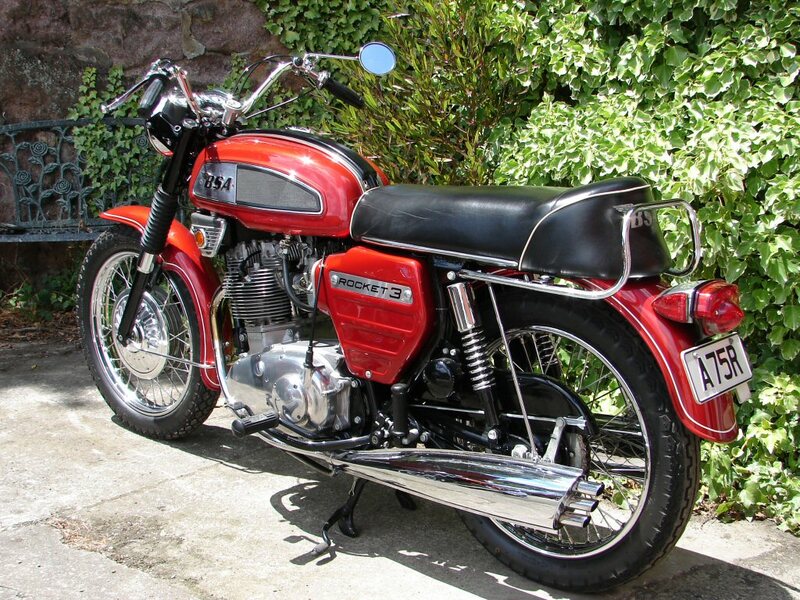 He was in the BSA owners club and had a Rocket 3. He had gotten pretty enthused after attending an International Rally in Australia and was organising a "Triples Run", so had tried to track down anyone who might be interested in coming along. I was. And I did. It was the beginning of a long friendship with Andy, and the start of a very strong group of motorcycling stalwarts who are together still. Most of us attended Andy's annual triples runs every year in late October, early November, as weather dictated. 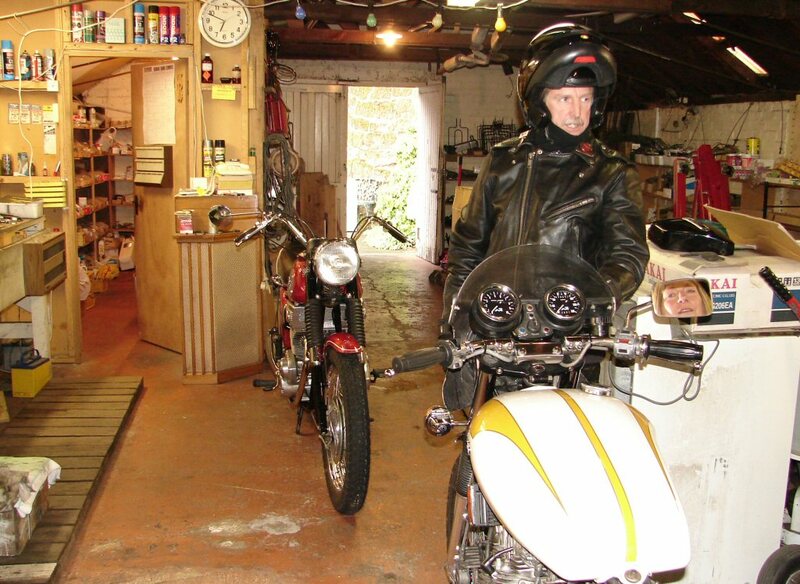 In 2003 Andy began bringing his bike to me for various maintenance issues. He was up to oil changes and routine adjustments but lacked the confidence to tackle issues inside the engine or complex mechanical items. I took this pic in 2006 just before that year's run as he had brought it in because there were some tuning issues. I went through the usual stuff and he came to collect it this day. I got a nice view of Sue in the rear view mirror as it happened. Andy was very particular about his bike. He had bought a very nicely restored example, and although he used it regularly, it always looked as though it had just been completed. Such was his committment to his beloved Rocket 3. I was privileged to be asked to work on it for him. I understand that now. There is no doubt in my mind whatsoever. This was the most immaculate '69 Rocket 3 in existence in 2003. From any angle at all it was perfect. 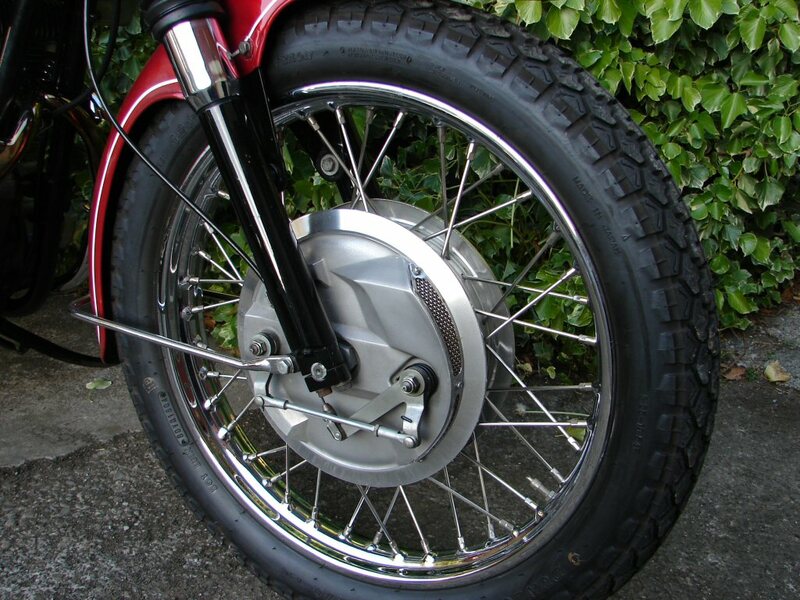 My ministrations were only superficial, as it was quite sound and only requiring the usual minor attentions that any bike being used would require. As it happened, I travelled many miles in Andy's company, and usually I was glued to the sound of his raygun mufflers. He was not put out by my proximity as we rode, but I always backed off as corners approached, as I do after all require my own line. Visually - as in aurally - Andy's bike was something else. As it happened, this visit of the Rocket 3 co-incided with a very busy time in my workshop - but all for the best reasons. 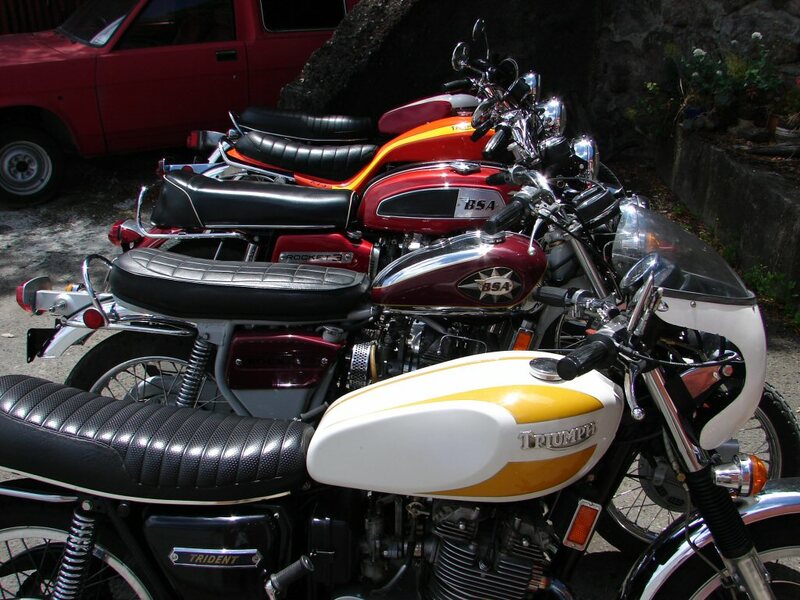 It was December 2008, and a number of bikes which had developed problems during that year's triples run were in for attention to problems that were noticed on the run. As they were all fabulous examples of their type I simply had to line them up and record the occasion. You will notice in that photo, that the topline of the Mk1 Rocket 3 is much taller than any of the other triples. Both seat and tank are higher, and this gives the rider an impression of sitting on top of the bike rather than in it. I have always found this feature rather disconcerting. I could almost have forgiven Andy's bike for this feature, simply as it was so accurate in it's build quality. Every single sub-assembly of this bike looked as though it was probably 100% better than a production model. 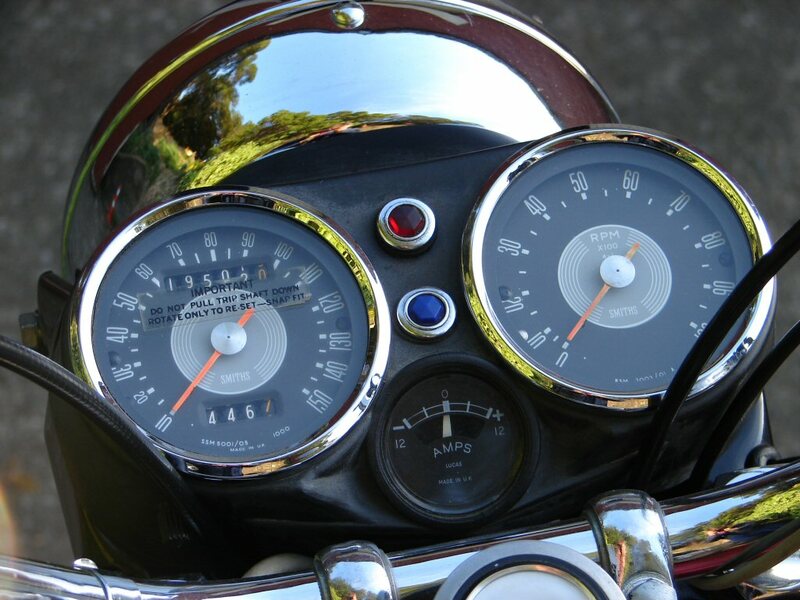 Most unfortunately, I took these photos when the bike was being advertised for sale in late 2010. Andy was diagnosed with a very nasty brain tumour in 2008, and all the prescribed medical approaches failed to give him much more life. He retained his inimitable sense of humour and we all rallied around him and wife Di in the precious few years he had left. I took best care of his bike of course. Normally images of these details would hardly be worth sharing, but I am sure that you can all see as I did, that this was an exceptional machine and maintained to the highest standard. 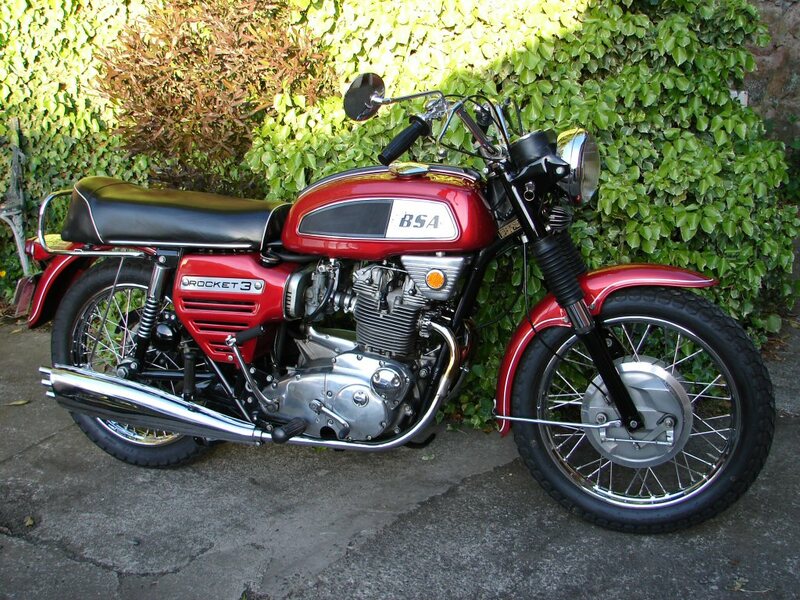 February 2010 was the occasion of the BSA International Rally being held in our home town. It sure got a lot of juices flowing amongst the local British biking fraternity. We were all an integral part of that. 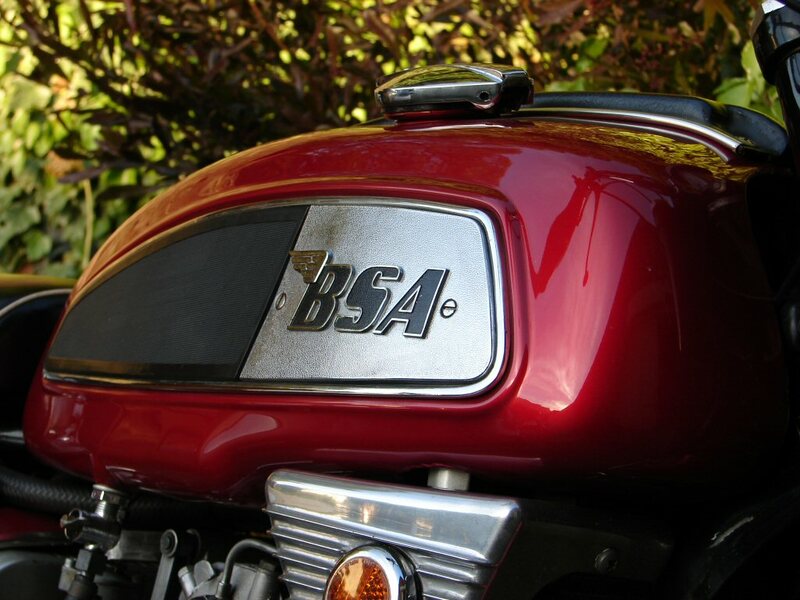 Despite not owning a BSA I joined the club because many of my friends were members. Especially Andy. 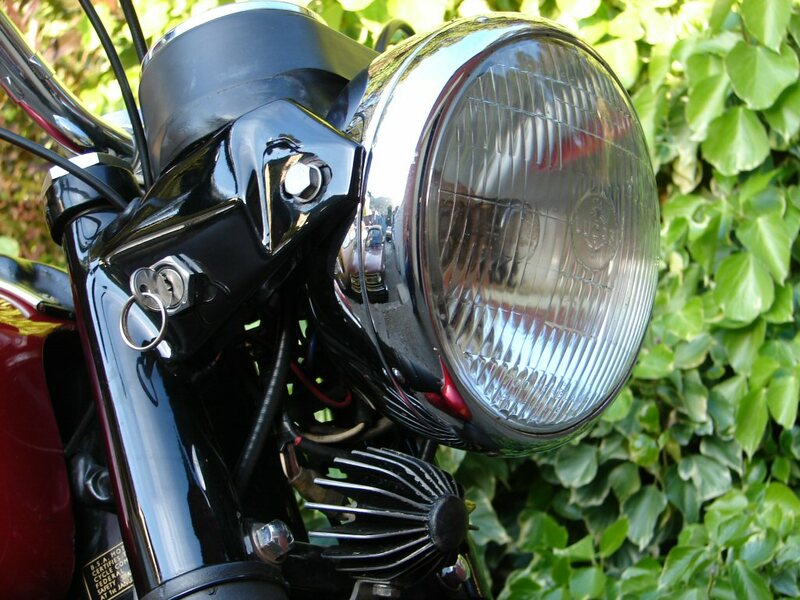 Andy was well and truly in the throes of chemotherapy by the time of the rally, and the risk of seizures meant he could not ride. I rode his Rocket 3 and he was my pillion. It was a very sad but valuable time for me. 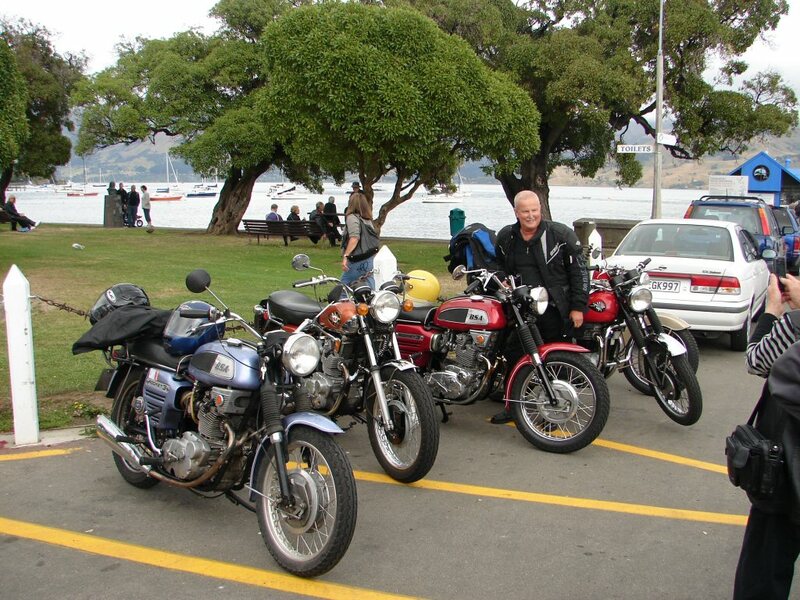 Andy poses with his bike at Akaroa during one of the rally runs, my 1970's helmet on the seat. Interestingly, the lilac Rocket 3 in that photo belonged to a couple from the UK, who I would never have met had it not been for Andy's influence. Meeting them resulted in a major tour of America in 2014, and Andy's Di accompanied us for half of it to honour his spiritual attendance. He would have loved every bit of it. Andy died before the 2010 triples run. We ran it in his absence but in his memory. The attendance was concurrent with that fact. 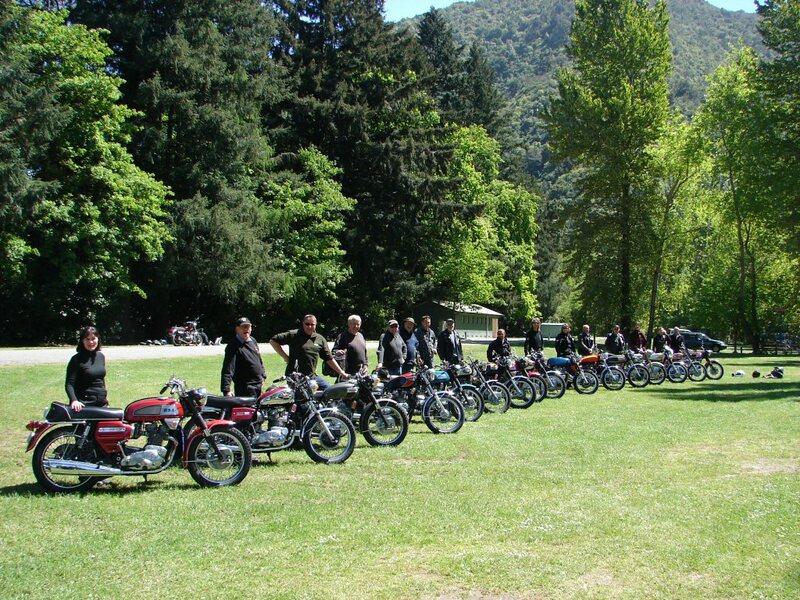 While our group are all solid in our devotion to these bikes, we suffered a cruel blow with the loss of Andy. He was the single entity who was responsible for us all meeting each other. It was nice that we were able to support Di in the time after his transition, but so sad that having arranged this wonderful group of like-minded folk, he then checked out without experiencing the depth of the great bond that we all continue to share. 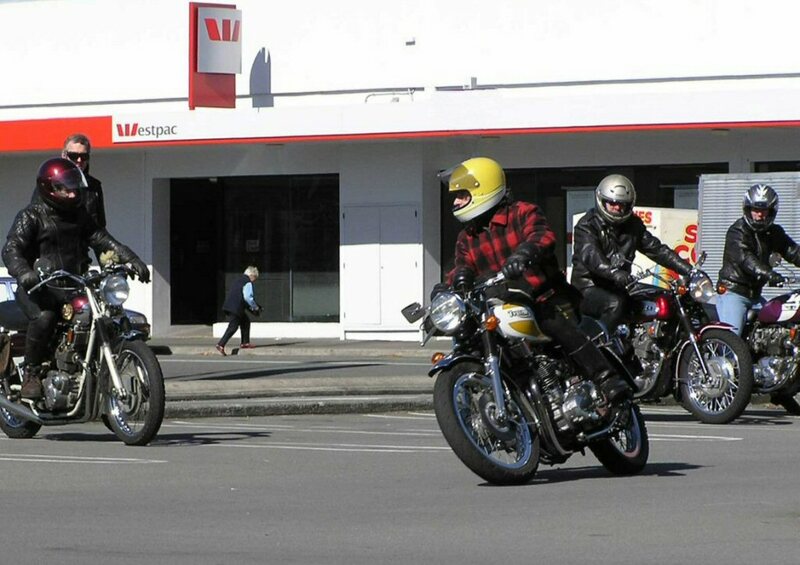 I was instrumental in selling his bike to a deserving new owner in Tasmania, and we all drank whiskey together as it got crated up prior to shipping. The new owner kept contact for some time and was equally in awe of the machine that Andy had loved so well. There is however a day that I remember very well, quite early in my knowledge of Andy. 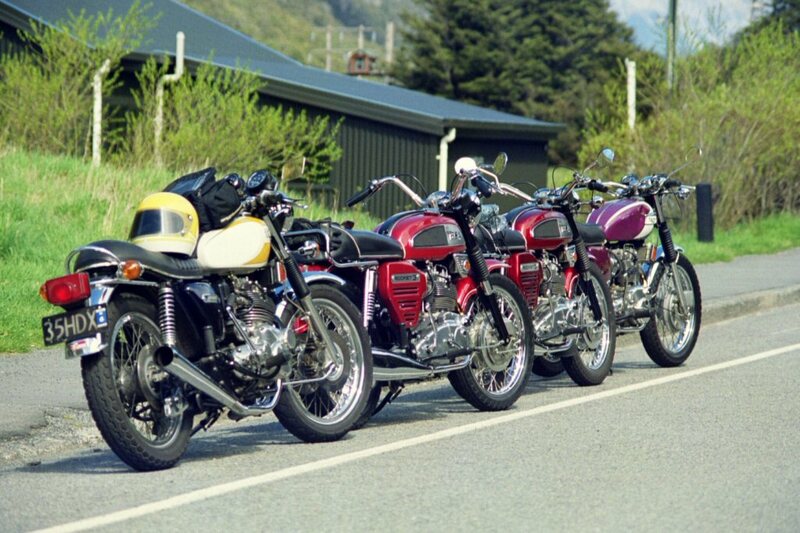 It was the triples run in 2004, and 4 riders completed the ride, although a couple more went part way. I got snapped as I left the carpark at the start. 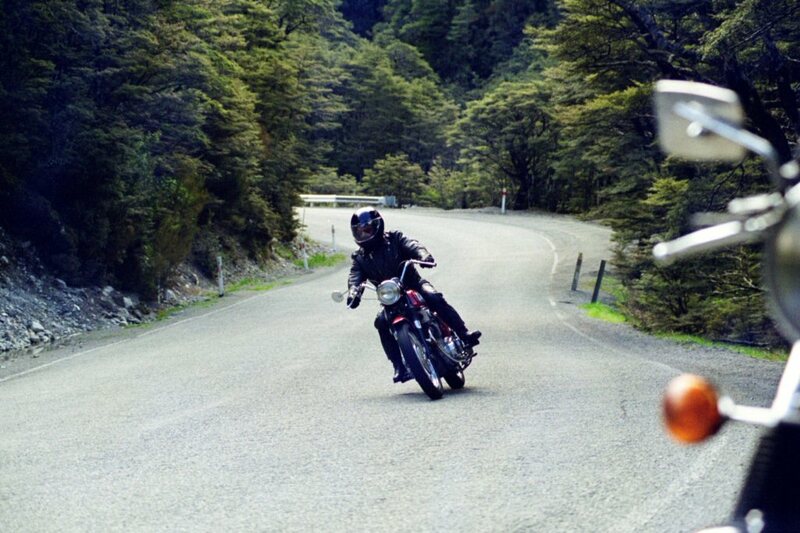 We enjoyed a great ride to the West Coast over the Southern Alps to Moana and back again, and it was the only time I ever saw Andy go kinda wild. I am in the habit of ambushing riders with my camera, and did so a number of times on this ride. Coming back, Andy played me at my own game, and caught a pic of me as I came over Arthurs Pass, so while he was putting his camera away I got ahead and set him up again just before the township and got this wonderful shot of Andy in the office. We paused in Arthurs Pass and I got this shot of our 4 triples lined up in a totally unrehearsed line astern study, Andy's in front of mine. As we left Arthurs Pass, Andy suddenly made a dramatic passing manoeuvre and shot away, so I gave chase. We tore through the twisty section of road and then belted out toward the Bealey Pub, my speedo at least registering over the 100mph mark. I remember marvelling at how he could even hang on to those high bars at such a speed, but he was having fun indeed. We could not have known then what would happen in the future, and it is fitting that we were able to enjoy such a day to it's fullest. Andy was a unique being and we were so lucky to have enjoyed the knowing of him.